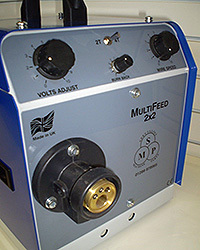 The SMP Multifeed 2 x 2 heavy duty geared wire feed unit is suitable for wire sizes of 0.6, 0.8, 1.0 and 1.2mm diameter with a maximum current load of 400 amps. 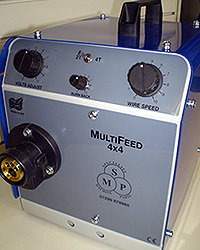 The SMP Multifeed 4 x 4 heavy duty geared wire feed unit is suitable for feeding wire sizes of 0.6, 0.8, 1.0, 1.2 and 1.6mm diameter with a maximum current load of 600 amps. Both models are available for 24, 42 and 110V AC operation. Top left hand side = Optional remote control of power source output voltage. Top centre = Burn back control – This controls the length of “stick out” of the wire when welding ceases. Centre toggle switch 2T = Pull trigger to weld, release to stop. 4T = Pull and release trigger to weld, welding will continue until trigger is pulled and released again. We supply all welding accessories, parts and consumables. 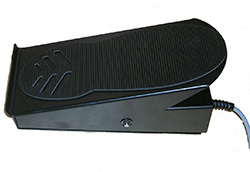 We can supply foot pedals to suit most makes and models of welding equipment. Below is a list of just a few makes we have supplied, but if the one you require is not listed, please contact us to see if we can help. Alternatively, if you have a foot pedal that needs repairing, please contact us with the details.